CHERYSE GREENIDGE, 2014 Barbados Scholarship winner. 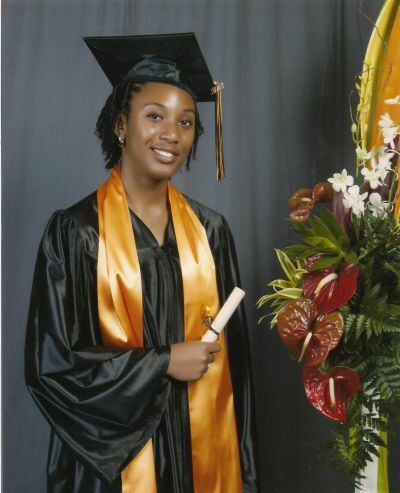 Cheryse who attended Christ ChurchFoundation School attainded 8 grade ones in years one and two in Chemistry, Physics, Biology, Communication studies and Caribbean Studies. She is the first student to win a scholarship since the school was granted government -sixth form status in 2011; and the first student in 60 years to achieve that feat at Foundation. She hails from Foul Bay, St. Philip. She is the daughter of Cheryl Greenidge and Jerome Davis. Youth on Stage Scholarship winner 2003. NIFCA drama/speech Silver Award 2005. Barbados Today online News Paper. September 9, 2014.
the island –– from the long summer vacation –– at least one school had an extra special reason for all the excitement. At the Christ Church Foundation School, pupils were greeted by a special guest –– Cheryse Greenidge, the school’s first Barbados Scholar in 60 years. The young woman met with students to give them some words of encouragement as they began the new school year.She advised them never to accept mediocrity and not to aim at just passing their courses. Furthermore, she suggested that they take part in sports and other extracurricular activities, as school was not all about academics. And, best of all, she offered to the students the secret to her success thus far: motivation. “You may think that my achievements came with doing nothing but studying; but that is not the case. I personally do not consider myself to be in the group of the very bright, and I believe that most of you will say the same about yourselves. So how can someone not in that category get a Barbados Scholarship? Simply, you have to be motivated. “You have to be interested in, and dedicated to what you are doing. You also have to sustain your interest until you have achieved your goal,” Greenidge said. Speaking in Christ Church Foundation School’s auditorium, as principal Robert Cumberbatch and staff honoured her with the [hanging of her picture in the Hall], Greenidge added: “From first to sixth form I really wanted to do well for myself. I knew that in doing so I would make my teachers, my parents and my family proud. I always made sure I did my homework when it was given. I always read over my notes from time to time so that I would not have to cram when a test was due. “I encourage you to try to do the same, if you too want to do well. Additionally, Greenidge explained that to achieve success didn’t necessarily mean one had to give up all one’s social habits. And for top achievers, her suggestion was to say focused, not be easily distracted, have good time management skills and learn to balance work and play. She also implored first formers to think beyond the age-old “good school, bad school” debate and give of their best at Foundation School. “I don’t know how many of you first formers cried when you got your results, because you did not want to come to Foundation. Don’t worry. I assure you, you will enjoy your years here . . . . Our school is of a high standard in almost every academic and sporting discipline. Therefore the onus is on you to continue to keep our school at this level or to surpass it. The desire to uplift the name of Christ Church Foundation should be further motivation,” she said. And principal Cumberbatch, who vowed that Foundation won’t have to wait another half-century for the next scholar from the school, stated that he and staff would forge ahead to bring the best out of each child to ensure that other Barbados Scholarship and Exhibition winners followed. With an 85 per cent plus pass rate in the recent CSEC, the principal was hopeful Greenidge’s success as well as the achievements of other student will be motivation for the entire student body, particularly the 192 new students welcomed into the school this morning. There have been 24 visitors (120 hits) to this page today. Updated and current.